Click here to make a 100% tax-deductible donation and share our legacy in 2017! 2016was a great year for the Bicycle Coalition, and the region’s cyclists. Our organization saw the opening of new bike lanes and trails in the City of Philadelphia and the greater 9-county region, made inroads with elected officials and bureaucracies in the region, and saw many of the campaign promises we pushed for in 2015 come to fruition. Our Cadence Youth Cycling program grew its impact, as did our Better Bike Share Partnership team, which works with the city to help expand Philadelphia’s Indego Bike Share system into neighborhoods outside of Center City Philadelphia. Keep reading to hear about our 2016 highlights. Early on in 2016, the Bicycle Coalition got some welcome news: Sarah Clark Stuart would be taking over as Executive Director of the organization. Stuart had been serving as the Coalition’s Acting Executive Director since November 1, when former Executive Director Alex Doty left the organization to serve as head of the League of American Bicyclists. She came into the job from the Deputy Director position, where she served for seven years. Since joining the Bicycle Coalition in 2009, she has been a key player in the Bicycle Coalition’s key accomplishments: mobilizing new funding for the region’s trail system, such as the $23 million TIGER construction grant; organizing a coalition to promote the regional trail network as “The Circuit”; advancing Philadelphia’s Complete Streets policy and the requirement that new construction projects include bike parking in the City’s code; and coordinating research and analysis of several reports on bicycling in Philadelphia. 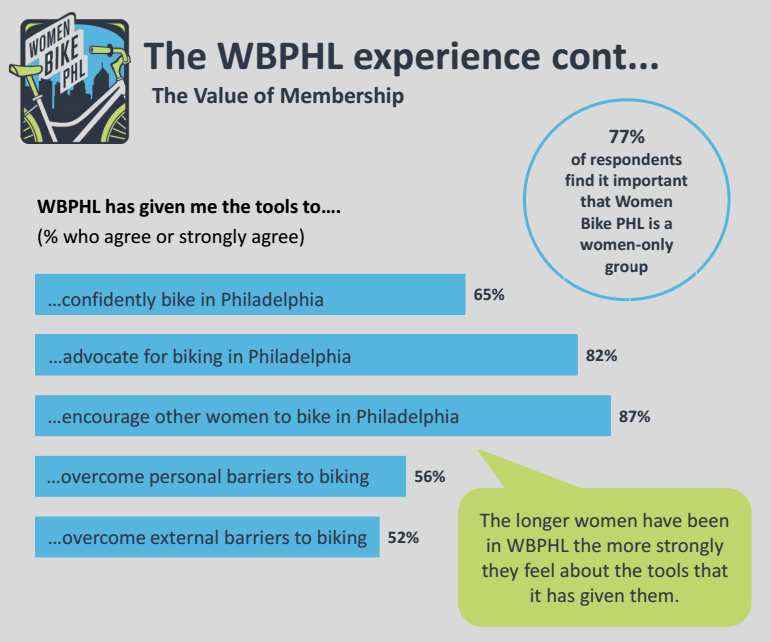 Early on in 2016, Women Bike PHL — a project of the Bicycle Coalition of Greater Philadelphia which aims to inspire more Philadelphia women to ride bicycles and build community among those who do — released a survey conducted by Sport Industry Research Center (SIRC) at Temple University. Through its outreach on social media and at community events, the group has grown to have just over 3,800 members and continues to grow. Members swap success stories and vent frustrations, and give and receive advice about the ins and outs of urban biking. How the survey came about is a good example of the group’s sense of community in action. 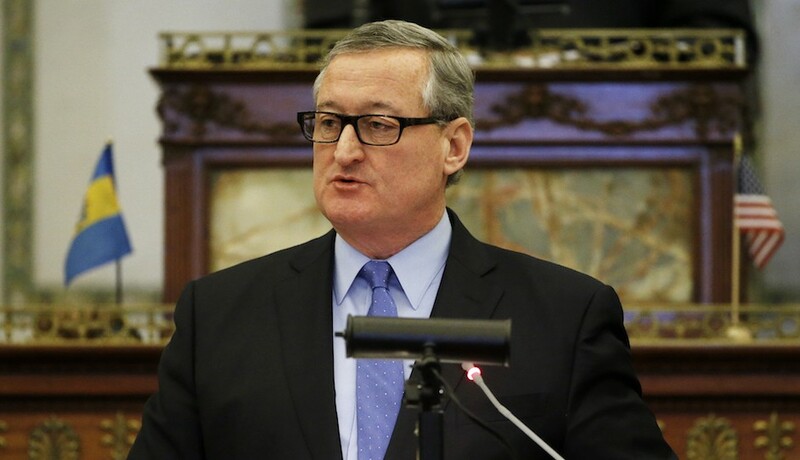 Mayor Jim Kenney was elected in 2015 after making several promises to the Bicycle Coalition in meetings, at our Mayoral Forum, and at the 2015 Vision Zero Conference the Bicycle Coalition put on with Jefferson University in December. He also put then-Interim Executive Director Sarah Clark Stuart on his Transition Team. Then, the Bicycle Coalition unveiled the Bike Lane Toolkit, an online tool to ask for, and organize around, new bike lanes in individual neighborhoods. A 2012 ordinance requires Council approval for new bike lanes which take away a lane of vehicle traffic. The bike lane toolkit was meant to bring together citizens and their representatives to help get bike lanes installed locally. 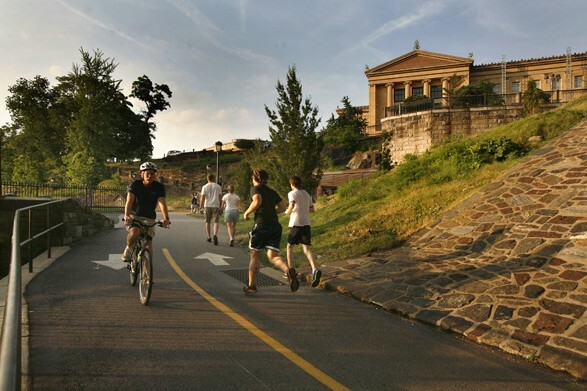 The Schuylkill River Trail was named the Best Urban Trail in the United States in 2015. Unfortunately, during that same time, physical and verbal attacks rose on the trail. 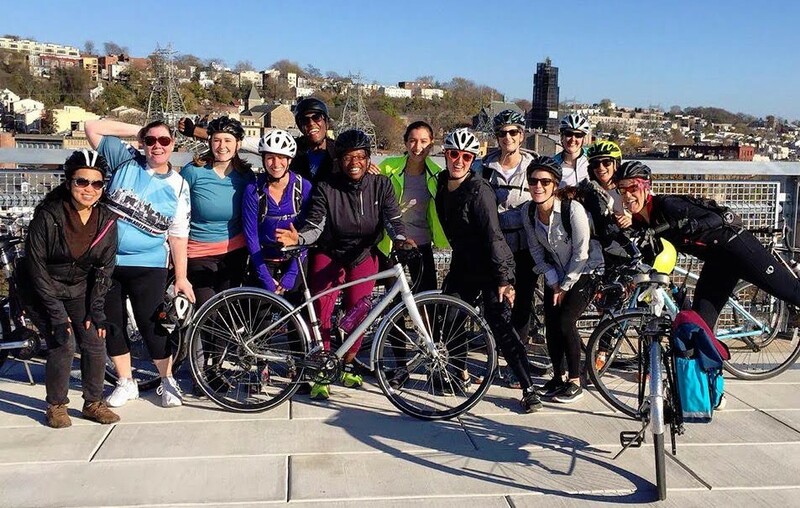 The Bicycle Coalition became involved in talks of creating the Schuylkill River Trail Watch along with many other community groups, the Philadelphia Police, and Councilman Kenyatta Johnson, whose districts covers the Schuylkill Banks. Numerous training sessions were held to teach ordinary citizens how to handle bad situations on the trail. The Bicycle Coalition of Greater Philadelphia and our Cadence Youth Cycling program teamed up with Neighborhood Bike Works, Gearing Up, and Philly Pump Track to put together 62 bicycles donated by Advanced Sports International and distributed to the above organizations. 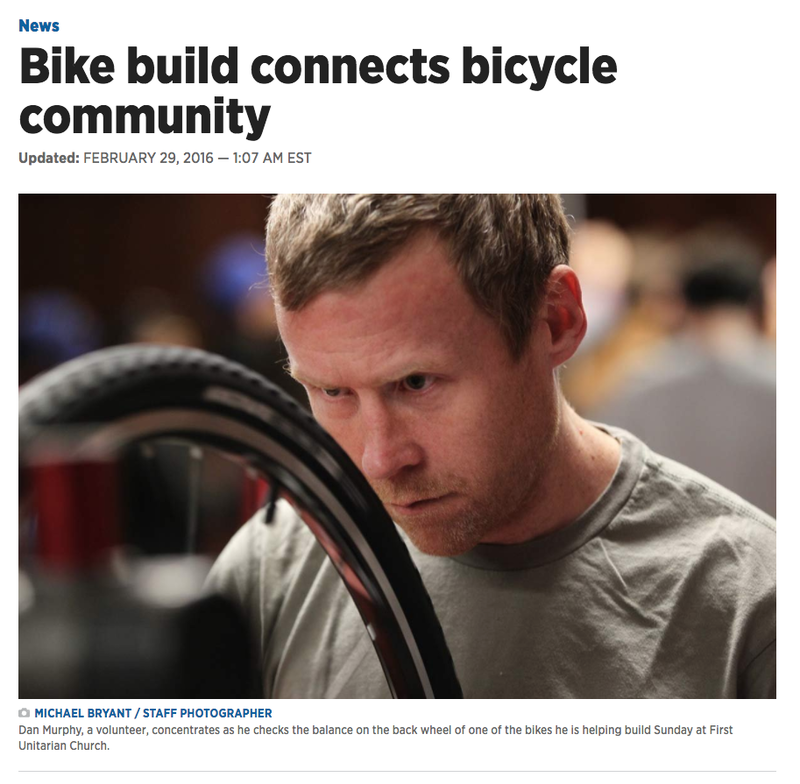 More than 100 people showed up to the First Unitarian Church in Center City to help out (and to eat some free Chipotle burritos) on February 28, and the bikes were constructed in record time. Youth, athletes, women in recovery, and others were soon riding these bikes in their respective activities. At the quarterly Pedalcycle & Pedestrian Advisory Committee meeting on March 17, PennDOT announced to its participants that it would initiate a pilot program to advance bicycle facilities on state roads in two metro regions: the Delaware Valley Regional Planning Commission PA counties and the Harrisburg area. 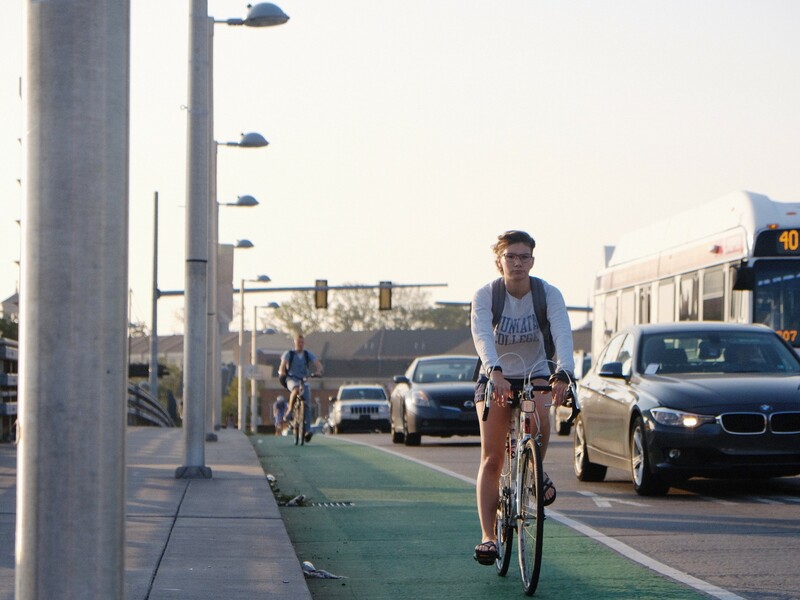 The announcement was a major breakthrough and represented a first step toward PennDOT removing the onerous Bicycle Occupancy Permit as an obstacle to the placement of bicycle lanes or other facilities on state roads. We’d been advocating for a solution to this obstacle since 2005. 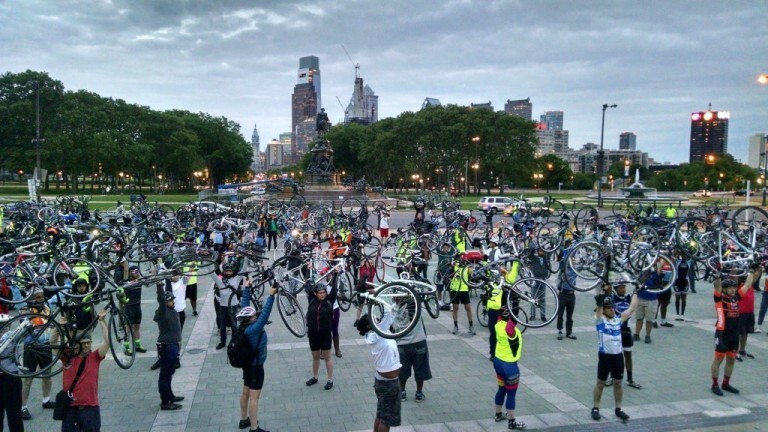 Earlier in March, we wrote about how several Pennsylvania bicycling advocacy groups were coming together to get rid of the Bicycle Occupancy Permit, after the Bicycle Coalition of Greater Philadelphia organized a sign-on letter to Secretary Richards. The Bicycle Coalition held its second Vision Zero Forum. This one was on safety cameras and how automated enforcement can help create safer spaces for all road users in cities. Click here to see 6ABC’s coverage of the event. None of these accomplishments would have been possible without the generous support of our partners. Click here to make a 100% tax-deductible donation and share our legacy in 2017! 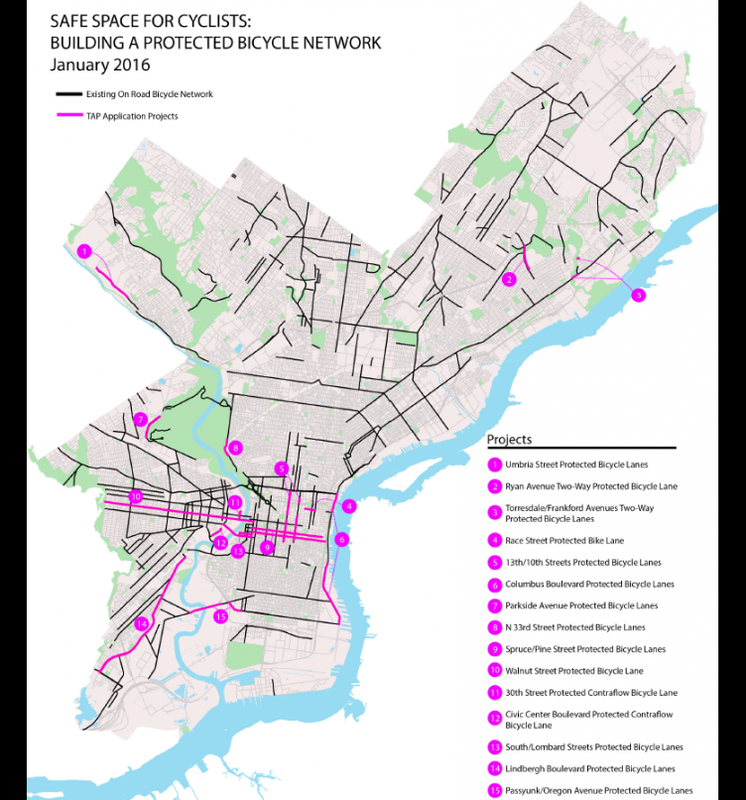 The city got a $300,000 grant for new protected bike lanes — part of a $7.6 million Transportation Alternatives Program (TAP) package from the Delaware Valley Regional Planning Commission to the region. The lanes planned for physical protection and safety projects by the city were outlined on the map below, and detailed in Plan Philly. It was cause for nervous optimism about Philly’s future; Chestnut Street’s lane in West Philadelphia is ripe for a safety upgrade. Spruce and Pine Streets’ 10-foot buffered bike lanes are also ready for upgrades to help keep Philadelphia’s cycling community safe, designs and community outreach for which will come in 2017. Additionally, the $300,000 grant is one of the two grants the city needs to put in protected infrastructure. Currently, Philadelphia is still waiting for a second TAP grant from the state of Pennsylvania. The Bicycle Coalition and active citizens began meeting with City Council officials and their staffs in April to talk about how to make their districts safer for bicyclists — a direct result of the Bike Lane Toolkit. 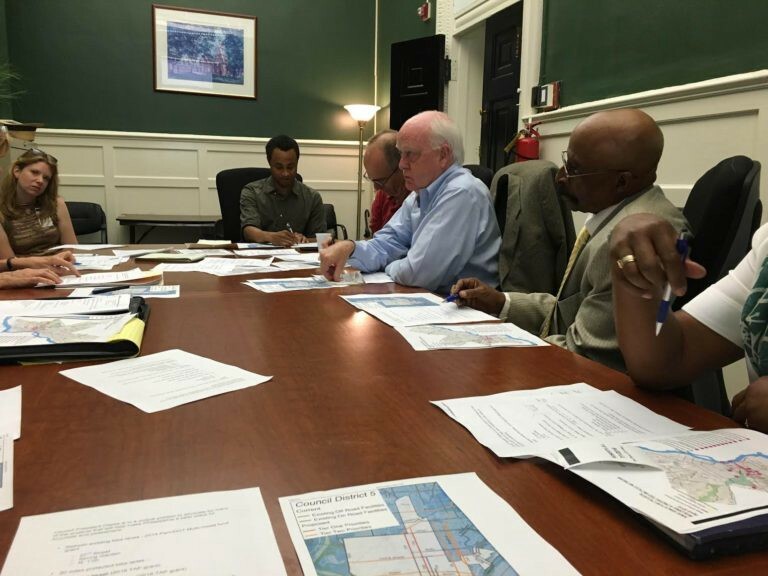 Throughout the spring, Coalition staff and constituents met with Districts 1,2, 3, 5, and 7 to discuss new bike lanes in those parts of the city, which respectively represent South Philadelphia, North Philadelphia, West Philadelphia and Center City. We provided constituents and Councilmembers with maps of the districts, planned lanes, and funded lanes. The strategy and meetings were frustrating, for sure, but gave residents a chance to let their representatives know that they care about safety for all — not just those with the privilege of owning a motor vehicle. 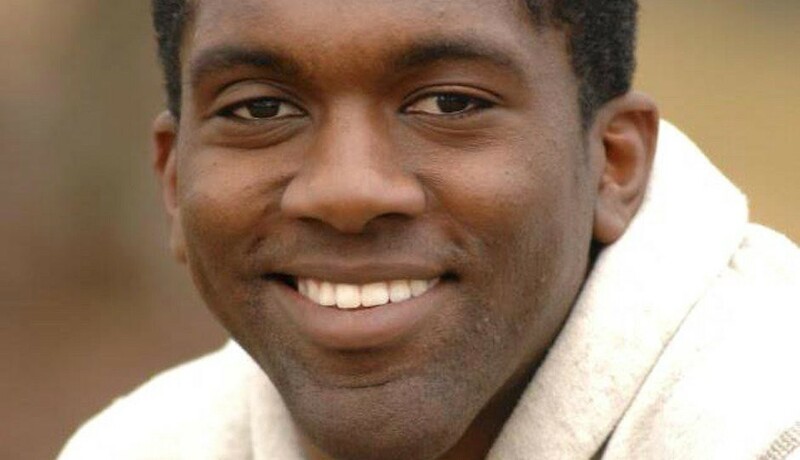 Tragically, Philadelphia engineer Jamal Morris was killed by a hit-and-run driver after riding his bicycle on Market Street in West Philadelphia on April 19. 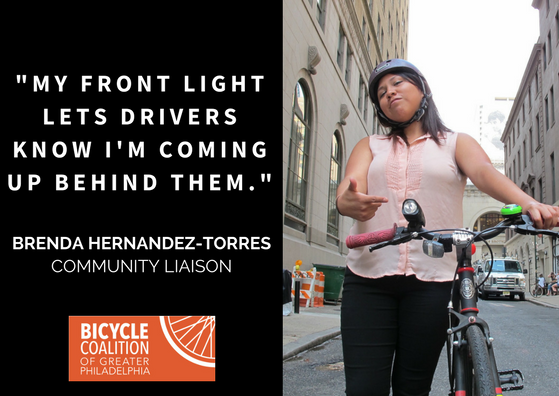 Morris’ family and friends soon contacted the Bicycle Coalition of Greater Philadelphia and asked how we could work together to make Philly’s streets safer for cyclists. Over the next few months, the Bicycle Coalition and Morris’ friends and family would travel to Harrisburg and Philadelphia City Hall to talk about ways to make our streets safer. The Morris family would also join a meeting with the Bicycle Coalition and Councilwoman Jannie Blackwell (the district in which Jamal was tragically killed) about ways to make Philadelphia safer via new infrastructure, including a protected bike lane on Chestnut Street in West Philadelphia. And our hard work would begin paying off: Our advocacy helped extend Pennsylvania’s red light camera law another 10 years. Red light cameras have been proven to make motor vehicle users safer on roads, and the revenue created through automated ticketing goes directly into better engineering for streets. Red light cameras also bring in approximately $5 million to the state of Pennsylvania each year, half of which goes to the City of Philadelphia. The Bicycle Coalition and our allies continue to stand beside Morris’ family and friends to work for safety on our streets. In 2017, Morris’ mother, Channabel, will join the Bicycle Coalition at our annual Vision Zero Conference. Bike Camden County, the Bicycle Coalition’s newest county affiliate group, launched in April with the goals of tracking implementing the county’s bicycles and trails plan, as well as Camden County’s cross-county spine trail. Bike Bucks County organized support for the Newtown Rail Trail in Northampton Township. 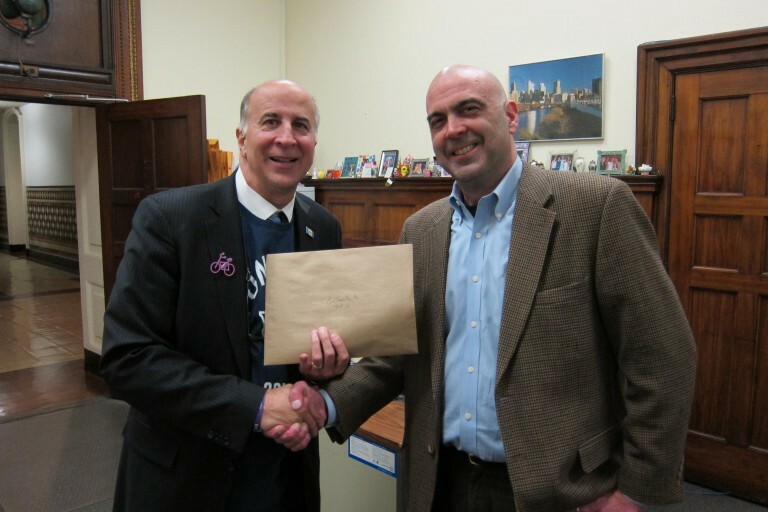 In addition to bringing residents out to local meetings for the new trail, the Bicycle Coalition worked with Bike Bucks County to generate hundreds of letters to Township Supervisors and petitions to create a new connection for The Circuit in Bucks County. For Bike Month, the Bicycle Coalition helped put on many of the regular events during the month of May, include Bike to Work Day, Bike to School Day, and the Ride of Silence. Hundreds of people participated in the Bike to Work Day rides, and press conference at City Hall with city representatives afterwards. 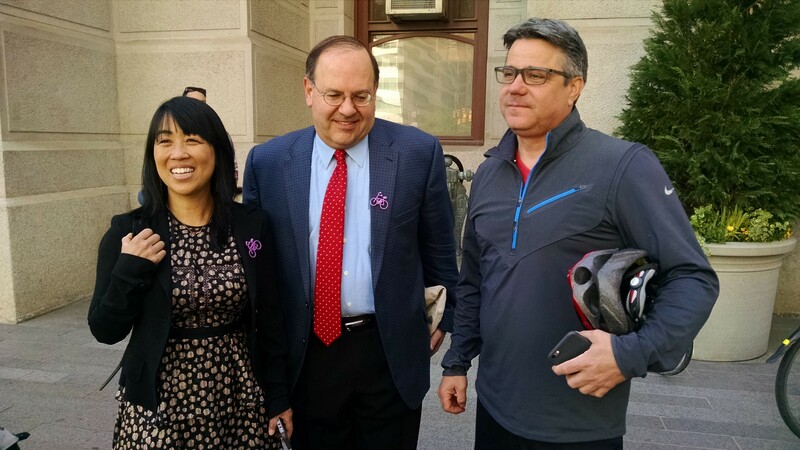 We were joined by Councilpeople Bobby Henon, Helen Gym, and Alan Domb; and Mayor Jim Kenney. All gave speeches about how the city needs to better accommodate bicyclists and make our streets safer for all. Bike To School Day was Wednesday, May 4, and 12 schools (the most ever) participated in the national awareness and fun day. 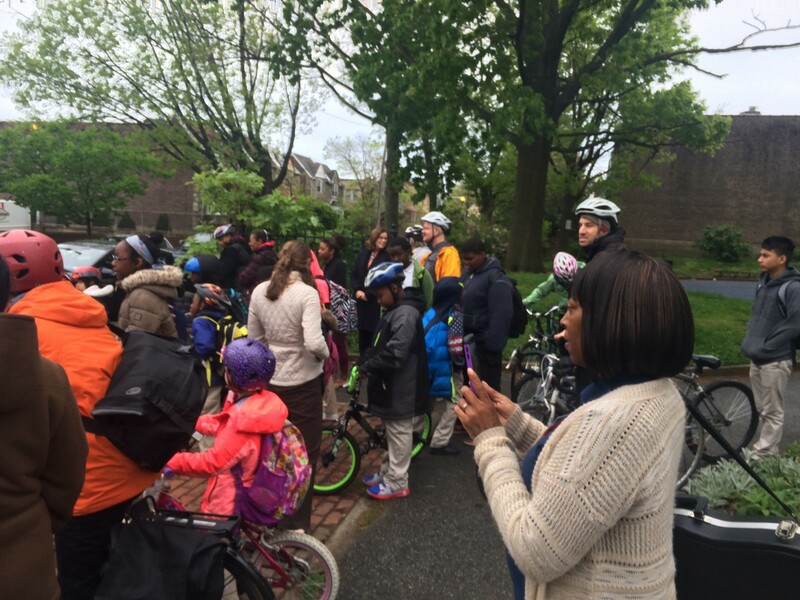 Bike To School Day provided safe spaces for any children at schools in nearly every direction who wanted to bike or walk through their neighborhoods to school. Safe Routes Philly Coordinator Waffiyyah Murray worked with leaders and students at D. Newlin Fell Elementary School, Francis Willard Elementary School, G. W. Childs Elementary School, Henry C. Lea Elementary School, Loesche Elementary School, Meredith Elementary School, Andrew Hamilton Elementary School, Cook-Wissahickon Elementary School, Albert Greenfield Elementary School, James Sullivan, Northeast High School, and Alexander Adaire Elementary School, to make sure this year’s event was safe, fun, and inclusive to all students, teachers, administrators, parents, and volunteers who wanted to participate. In addition to creating Walking School Buses and group rides in neighborhoods, schools provided bicycle storage for students, Safe Routes Philly, which is supported by the City of Philadelphia Department of Public Health and a National Highway Safety Administration grant awarded to the Office of Transportation & Infrastructure Systems, provided bike swag and lessons for those participating. 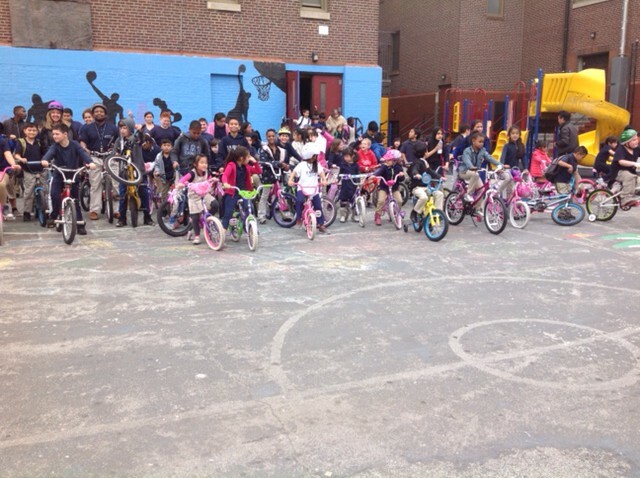 Bicycle Coalition members and volunteers brought donated books to Andrew Jackson Elementary School in West Philadelphia at this year’s Ride for Reading event as part of the city’s Safe Routes Philly program. As part of the event, PECO awarded Bicycle Coalition Board Member Amanda Benner their prestigious 2016 Energy For The Community Achievement Award, and they made a video about it. 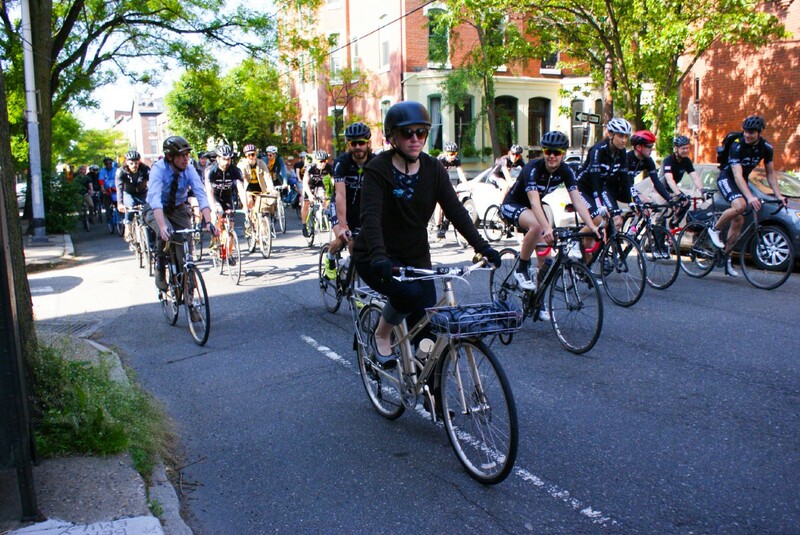 On Wednesday, May 18, hundreds of bicyclists came out to Philadelphia’s largest Ride of Silence ever. The ride is an annual international event to commemorate and remember those bicyclists who’ve lost their lives to traffic violence on our streets. 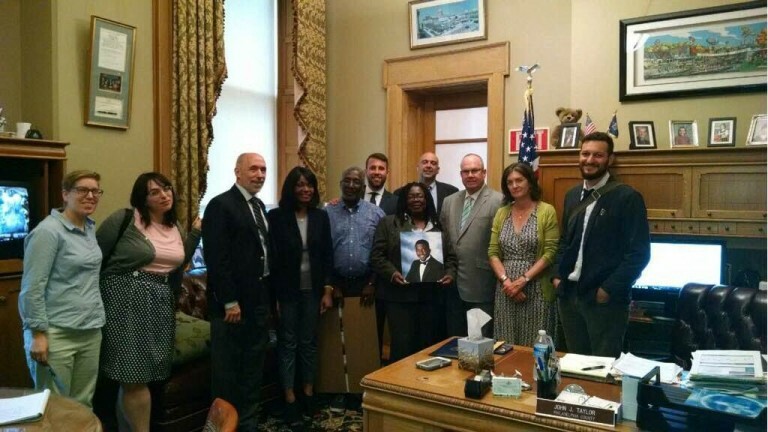 Earlier in the day, members of the Bicycle Coalition accompanied Channabel Latham-Morris, the mother of bicycle hit-and-run victim Jamal Morris, to Harrisburg, where we met with numerous legislative staffers representing senators from all over Pennsylvania, to advocate for new red light and speed camera laws. Morris made the trek back to Philadelphia later that day to light a candle at the Ride of Silence, and participated in several other meetings on Thursday to make Philadelphia’s streets safer. 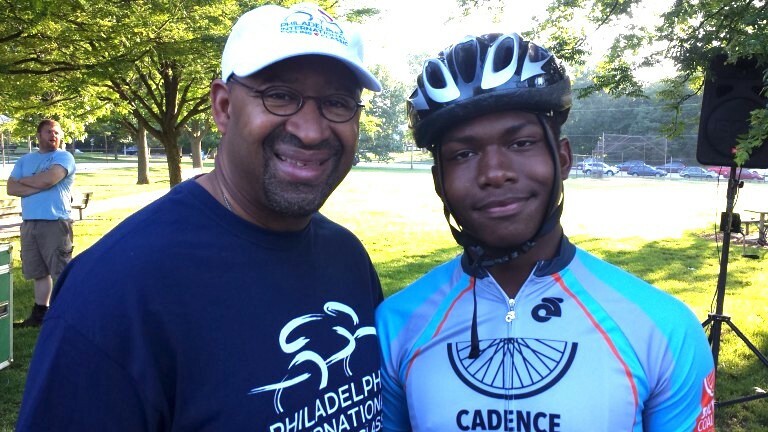 Jenice Armstrong at the Philadelphia Daily News wrote about the Morris family, and the Ride of Silence. The Bicycle Coalition and Morris family would soon prevail, getting the red light camera bill extended for 10 years. The push for safety and better streets continued into Summer 2016. 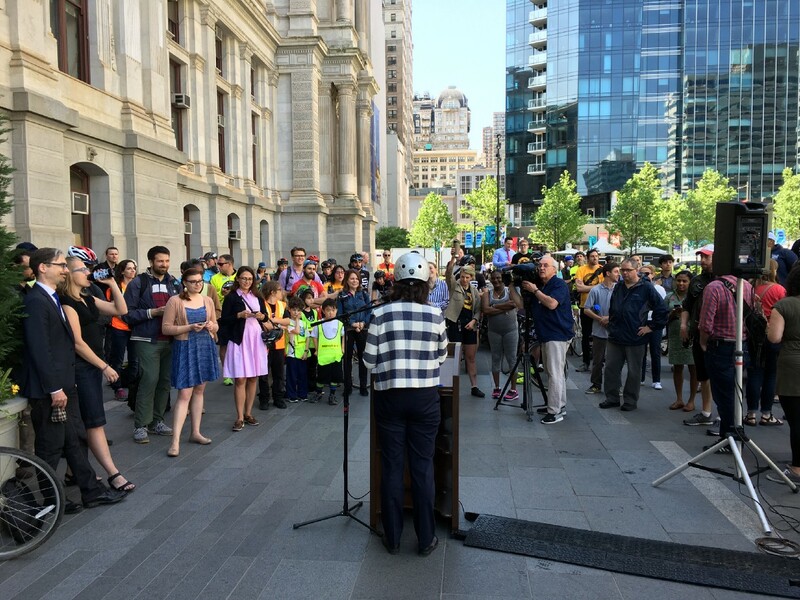 The Bicycle Coalition began organizing groups throughout Philadelphia to create a Vision Zero Alliance, and rallied for better, safer bike lanes throughout the city, with money Philadelphia had previously received. First off, the city announced — finally — that it would add a protected bike lane to the South Street Bridge, which connects West Philadelphia to Center City, via South Street. Post construction, though, 200 feet of delineators will be installed on the Bridge in advance of the upcoming driveway into the Children’s Hospital of Philadelphia’s building to prevent right turns from drifting into the bike lane. This solution was confirmed by the Philadelphia Streets Department, and was arrived at through negotiations between Bicycle Coalition, James Campbell, the City and Children’s Hospital of Philadelphia for the nearly two years. We are pleased that this solution was agreed to by all parties as it will provide additional safety for bicyclists passing in front of the new driveway. The South Street Bridge was on a map of new protected bike lanes the Bicycle Coalition had proposed during Mayor Jim Kenney’s transition. Above: 5th Square’s David Curtis, OTIS’ Clarena Tolson, BCGP’s Sarah Clark Stuart, and Fairmount Bicycles owner Shelley Salamon speak to the crowd about the importance of physically-protected bike lanes. 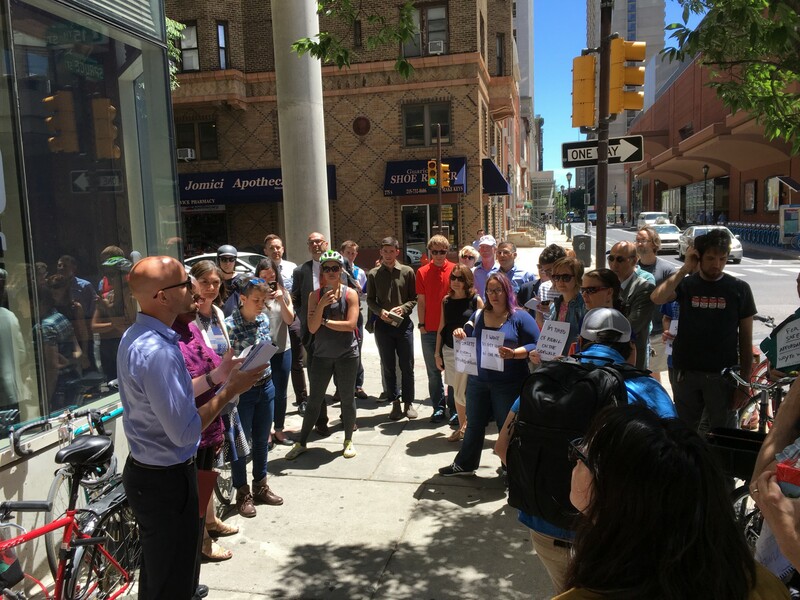 Alongside the 5th Square PAC, Deputy Managing Director Clarena Tolson, and Fairmount Bicycles owner Shelly Salamon, the Bicycle Coalition participated in a rally today at 15th and Spruce Streets encouraging the City of Philadelphia to move forward with a protected bike lane infrastructure plan as soon as possible. 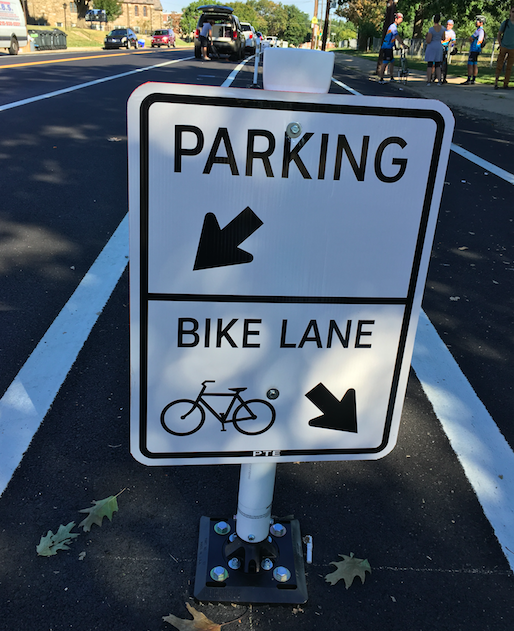 The Ryan Avenue lane is the city’s first and comes after years of talks and planning between the Philadelphia Streets Department, Councilman Bobby Henon, and the Bicycle Coalition of Greater Philadelphia. The new lane was covered extensively in local media. But one more piece of note about the lane is that during the city’s press conference, representatives of city government made additional public comments showing their dedication to 30 miles of protected bike lanes during Mayor Jim Kenney’s tenure. 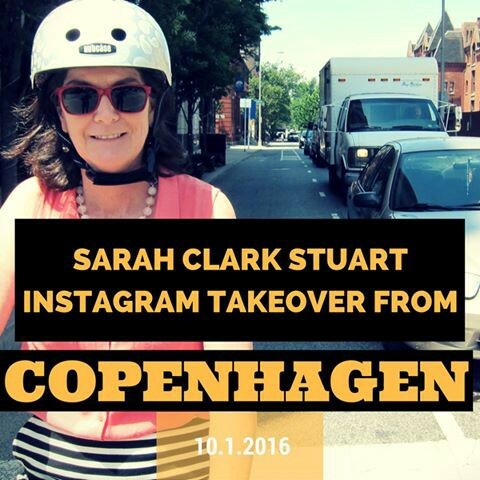 …And Sarah Clark Stuart was there to cut the ribbon. Additionally, a new buffered bike lane proposed by Councilman Bobby Henon passed City Council unanimously. This is the first buffered bike lane to be installed that would remove a lane of vehicular traffic since 2012, when Council passed a bill requiring they vote on such things instead of trusting engineers’ and other experts’ research and reports. Henon’s new bike lane is along Tyson Avenue in Northeast Philadelphia, from Roosevelt Boulevard to Frankford Avenue. 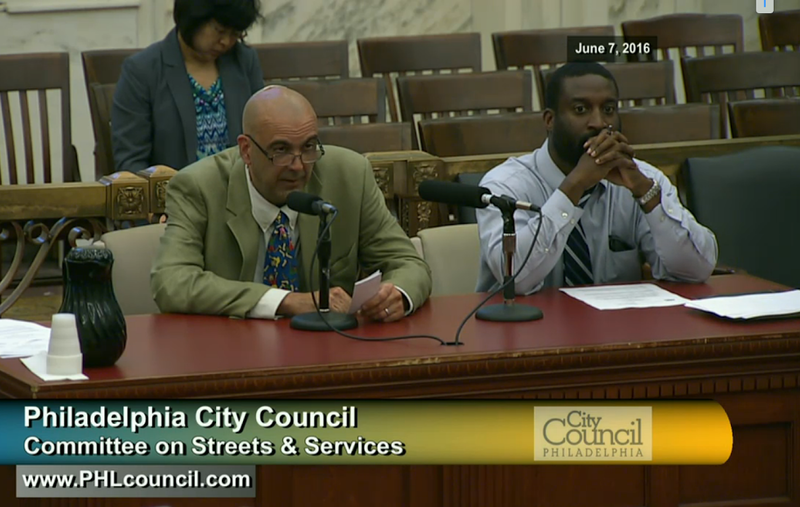 The Bicycle Coalition’s Bob Previdi testified in favor of the bike lane on June 7. 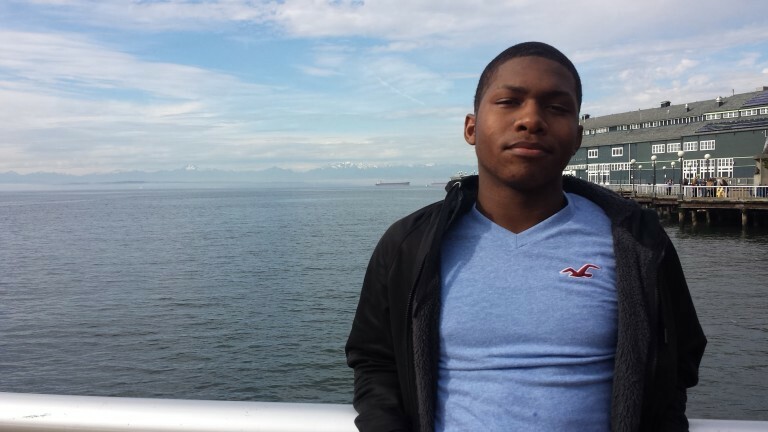 Cadence Youth Cycling graduate Allen Williams was selected as a Gates Millennium Scholar this summer — and we were all super proud of him. Williams was one of just 1,000 students across the United States to earn the award — out of more than 54,000 who applied. The award will help this young athlete and academic pay for his continued schooling. The Gates Millennium Scholarship is a prestigious grant funded by the Bill and Melinda Gates Foundation, designed to promote academic excellence and provide an opportunity for outstanding minority students to reach their highest potential. The 5th Street Tunnel has long been both a really fun, and really scary, route for cyclists — and that’s about to change a little. After more than a year of meetings and planning, the 5th Street Tunnel’s bike lane got flex-posts and new lighting this summer. Construction on 5th Street Tunnel was about to start, and a protected bike lane has long been a goal of Philly’s bicycling community. So, after speaking with our friends on social media, including Sara Hirschler, Bicycle Coalition research director John Boyle got in touch with the Streets Department and the Delaware River Port Authority, which is in charge of the tunnel while the Streets Dept. manages the road surface. 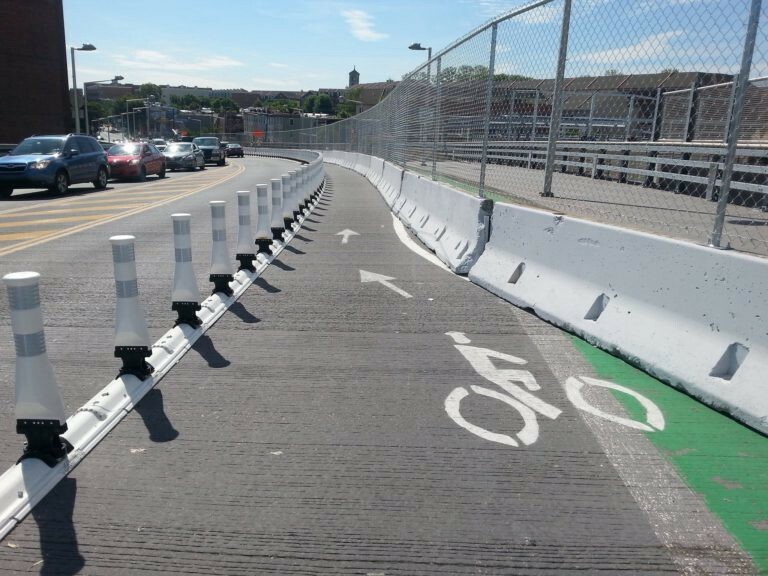 At a meeting between our organizations, and in additional conversations with the Streets Department and the DRPA, we suggested Streets install a buffered bike lane with flex-posts to better separate bicycles from motor vehicles using the tunnel. A public meeting was held. Both Boyle and Hirschler spoke out for a protected bike lane in the tunnel. We were later informed that the Streets Department, DRPA and Mayor’s Office of Transportation and Utilities were all thinking the same thing. On Friday, July 8th Cyclocross champion racer Jeremy Powers met the Cadence Youth Cycling Race Team; eight students, and several Cadence coaches, at Penn Treaty Park. He discussed his career, answered questions from the students, and explained how he got into cycling as a kid. 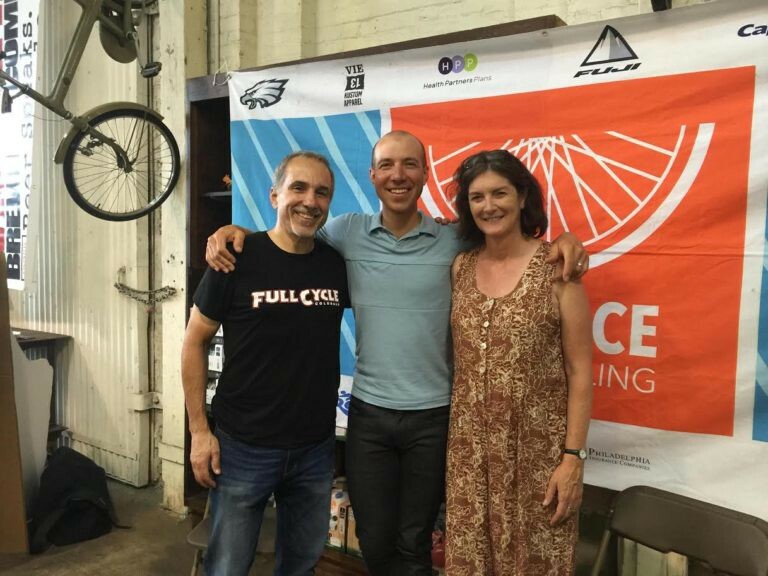 It was the beginning of an exciting weekend for the Bicycle Coalition of Greater Philadelphia’s youth cycling program, Cadence Youth Cycling, and others from around the region interested in the sport of professional cycling. After the meet-up at Penn Treaty Park, Powers, Coalition staff, Joe Piscitello, Marissa Perrone, and two of the Cadence Youth Advisory Committee members — Krystal Philson and Tamia Santiago — went out to dinner at Kensington Quarters before Powers, Philson, and Santiago spoke to a crowd gathered at Firth and Wilson on Frankford Avenue. Powers spoke for a short time, then answered questions from the audience. Many of the questions focused on cyclocross racing, health, diet and the challenges American pro cyclists face racing in Europe. A Verge Sports Raffle was held soon afterwards. Powers then gave a clinic at Sly Fox Brewery in Phoenixville, Pa., which was attended by several Cadence athletes, and others. DVRPC authorized $500,000 for better striping, installation and maintenance, bike lane signage, and symbols, for Southeastern Pennsylvania’s four suburban counties. These funds came about in part due to the Coalition’s advocacy for striping plans for seven state roads in the four counties. 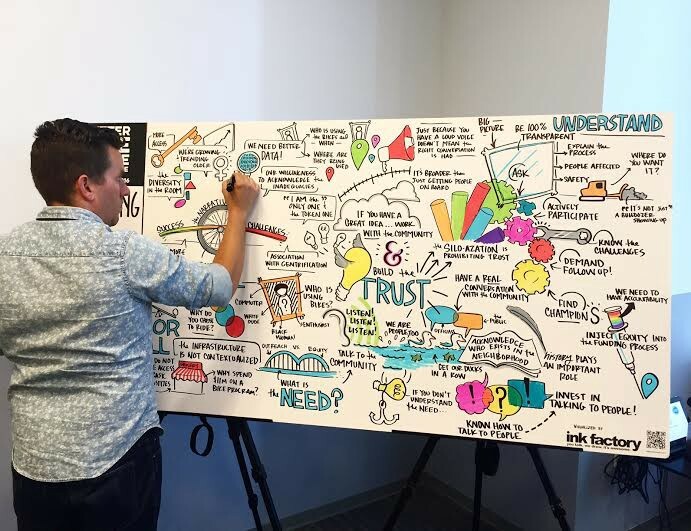 In June, Philadelphia hosted the first Better Bike Share Conference, a gathering that brought together system operators, city transportation officials, social justice advocates, and people that work to bring bike share to every community, to talk about what’s working, what isn’t, and how bike share can be a transportation tool for everyone. The Bicycle Coalition of Greater Philadelphia, the City of Philadelphia, the National Association of City Transportation Officials, the William Penn Foundation, and People For Bikes helped put together the Better Bike Share Partnership with the goal of increasing access and usage of bike share to underserved communities in the U.S.
Philadelphia was the first city to utilize Better Bike Share, which helped bring about a third of all bike share stations we received in 2014 to underserved communities. 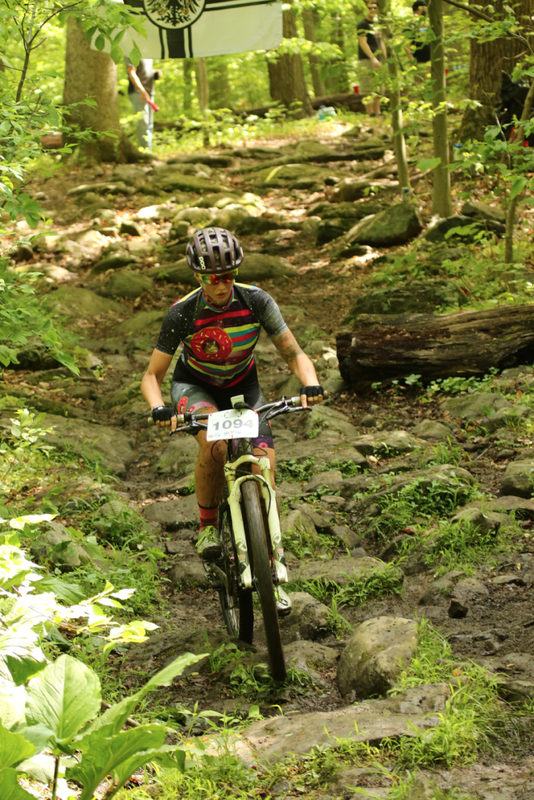 The Circuit Trails got more than $4.5 million in funding over the summer, thanks to grant awards from the Commonwealth of Pennsylvania that were announced earlier this summer. The money comes from state revenues generated by Acts 13 and 89, and grants made possible by a federal program for distribution by the states. 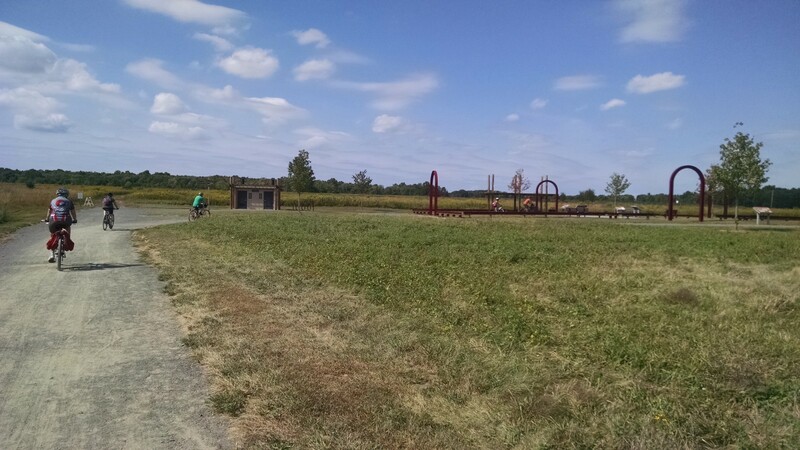 Municipalities and other entities competed for these grants, which can help fund diverse projects, ranging from trail construction, to watershed protection, to abandoned mine drainage. Meanwhile, the Circuit was re-launched and got a brand-new website, detailing the “100s of Miles of Happy” the Circuit has to offer, and giving users a stronger interface to plan out their routes for trail riding in the region. 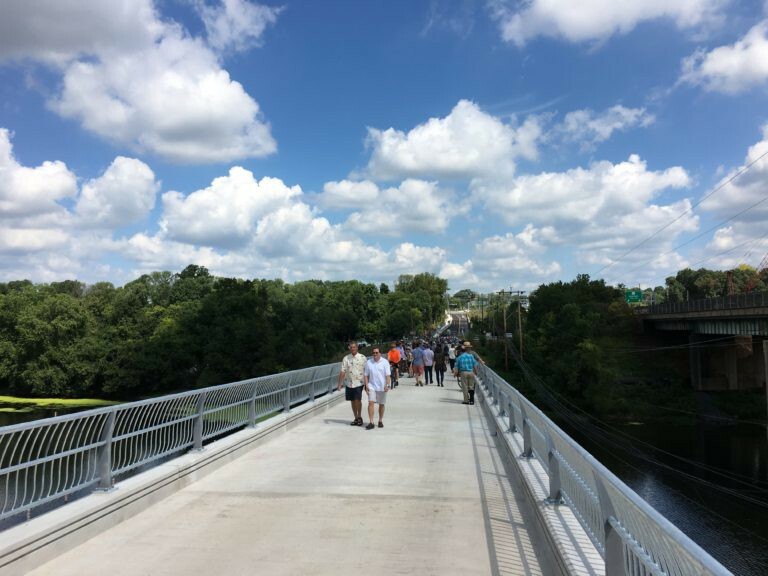 Meanwhile, Sullivan’s Bridge, connecting the Schuylkill River Trail and Valley Forge National Park, was set for a long-overdue opening. An original one-lane bridge, called the Betzwood Bridge, was built in West Norriton in the 1800s and had always been a nice connection for cyclists getting into Valley Forge National Historic Park. In 1991, PennDOT decided they had to tear down the bridge due to “severe metal corrosion.” They closed it. 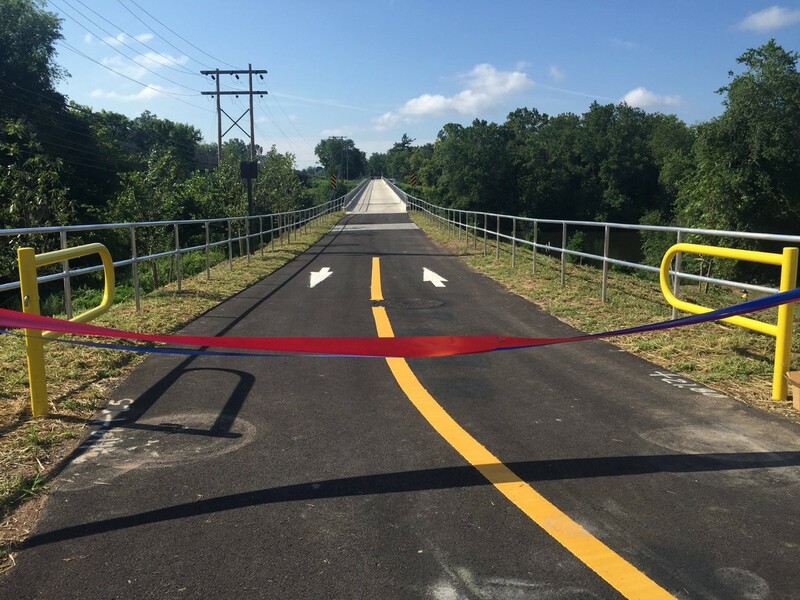 The Bicycling community has been fighting for a better bridge since, and finally got it in the Summer of 2016. 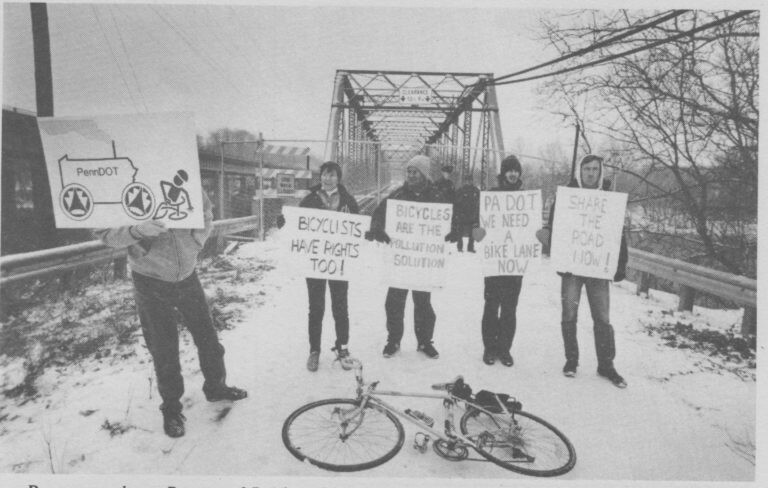 For more details of the long, long fight for Sullivan’s Bridge, check out our blog. Cadence Youth Cycling Athletes got to show City Council staffers the good, bad, and the ugly of Philly’s bike infrastructure this summer, and helped make the case that more work needs to be done to make our streets safer. 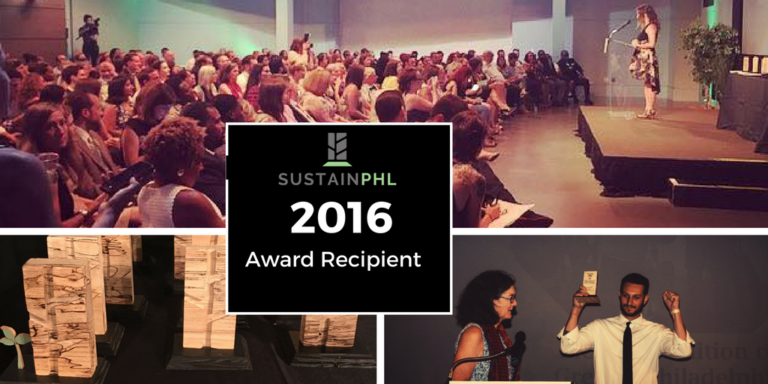 And after all that, the SustainPHL Awards recognized the Bicycle Coalition for our efforts in advocating for a better future for Philadelphia. It was a great night, and, for us, less a call for celebration than a call to action. 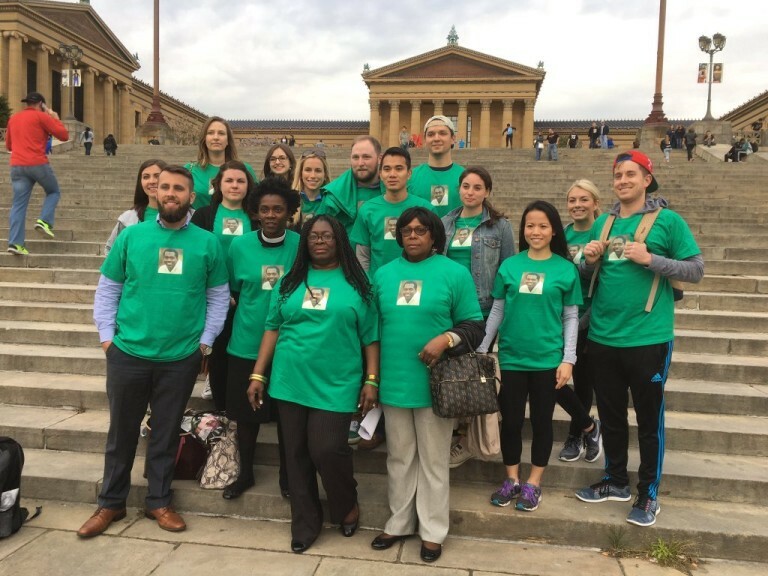 Nine Philadelphia-area organizations came together in late August to demand a comprehensive strategy to eliminate all traffic deaths in Philadelphia. Dubbed the Philadelphia Vision Zero Alliance, this group advocates for safer streets through new design, automated enforcement, education, and targeted goals. The Alliance includes the Bicycle Coalition of Greater Philadelphia, AAA-Mid Atlantic, the African-American Chamber of Commerce, 5th Square, the Clean Air Council, Run 215, Jefferson Hospitals, AARP, Public Health Management Corporation, Parsons Brinckerhoff, and others. All these groups believe in the need for Philadelphia to better focus on solutions for all Philadelphia’s neighborhoods to calm traffic and create new streets and corridors which respect human dignity. As part of our mission for a more educated, informed bicycling public, the Bicycle Coalition released its ‘Bike Nice’ campaign in the summer of 2016. As part of the campaign, the Bicycle Coalition set up a new website, BikeNicePHL.org, put new digital billboards in Dilworth Park in Philadelphia, depicting Bicycle Coalition staff, and hosted a street campaign, handing out free swag to cyclists on the South Street Bridge. The Bicycle Coalition of Greater Philadelphia has long been dedicated to getting rid of unused trolley track around many city corridors. Many of those tracks are from the old Route 23 trolley, which was suspended in 1992! Talk to a handful of cyclists, and you’ll probably hear at least a few stories about getting road bike tires caught in the tracks, and potentially, a crash. We began meeting with the Streets Department and SEPTA in early 2014, to find a way to avoid these needless incidents going forward. The plan focused on 24 intersections between South Philadelphia and Chestnut Hill, where the old Route 23 trolley used to take passengers. 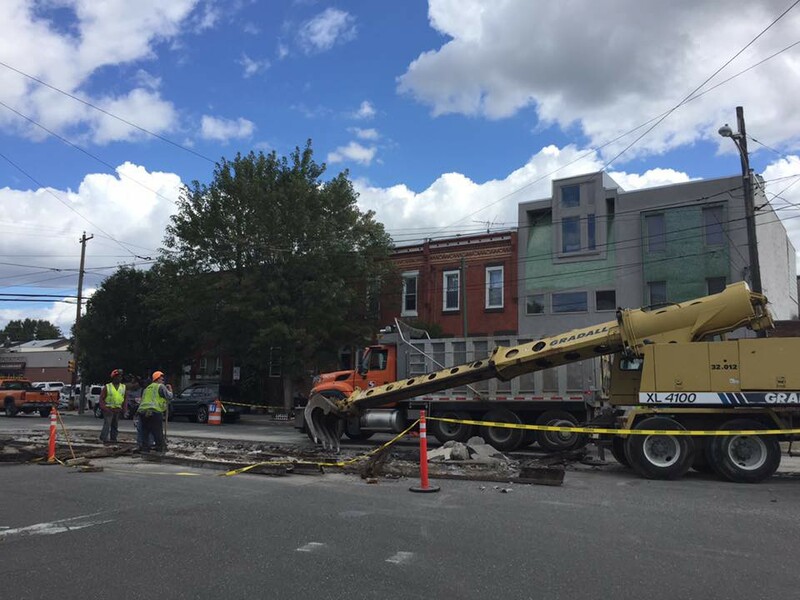 With the removal of the track at 11th and Reed Streets, SEPTA and the city had removed dangerous tracks at 24 intersections throughout Philadelphia. Over at the Streets Department, this work could not have happened if it weren’t for Bike/Ped Coordinator Jeannette Brugger and Streets’ Chief Engineer Stephen Lorenz. 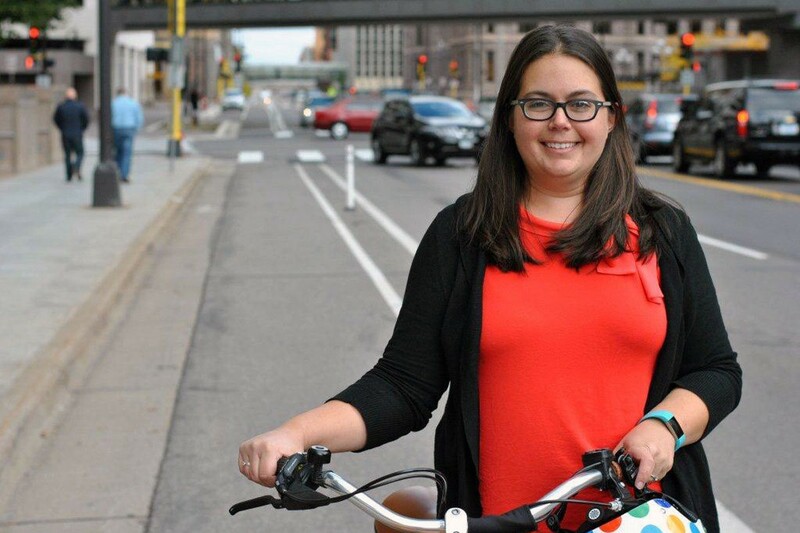 Our new Cadence Youth Cycling Program Manager, Taylor Kuyk-White, started on September 12th. Taylor joins us with a rich history in positive youth development work, competitive cycling, and social justice organizing. Taylor’s passion for cycling takes many forms as she is a year round commuter, a road, cyclocross, and mountain bike racer, an experienced mechanic, and a long distance bicycle tourist. Over the past 10 years, Taylor has worked to put this passion into action through her work with for women’s empowerment through BICAS (Bicycle Inter Community Art and Salvage) and Team Laser Cats, for community building through HUB (Helping Understand Bicycles) and One Street, and, of course, for Positive Youth Development through Neighborhood Bike Works. 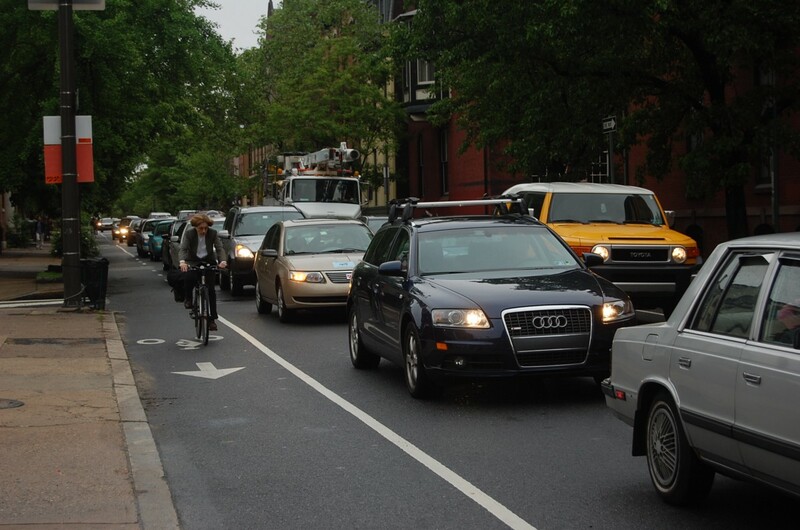 The Census Bureau released its yearly report this week on how Americans get to work based on the 2015 American Community Survey — and Philadelphia experienced a small surge in bicycle commuting. The report, which covers travel time, distance traveled, and means of transportation, found 2.2 percent of Philadelphians traveled to work via bicycle in 2015, an increase from a low-point of 1.9 percent in 2014. When cities with more than 1 million people are taken into account, Philadelphia is still the most-biked big city in the United States. While the Census has found that 2.2 percent of all Philadelphians use a bicycle, Center City stands at 7.2 percent mode share. That mode share puts the Central City Philadelphia public use microdata area (between Washington and Girard from the Delaware River to the Schuylkill River) at number 10 in the nation when compared to percentage of bike commuters. Center City District also found a 79 percent increase in bicycle commuters from 2010–2016. The Bicycle Coalition’s 2016 Gala and Awards Dinner was our most-attended and overall best Gala ever. 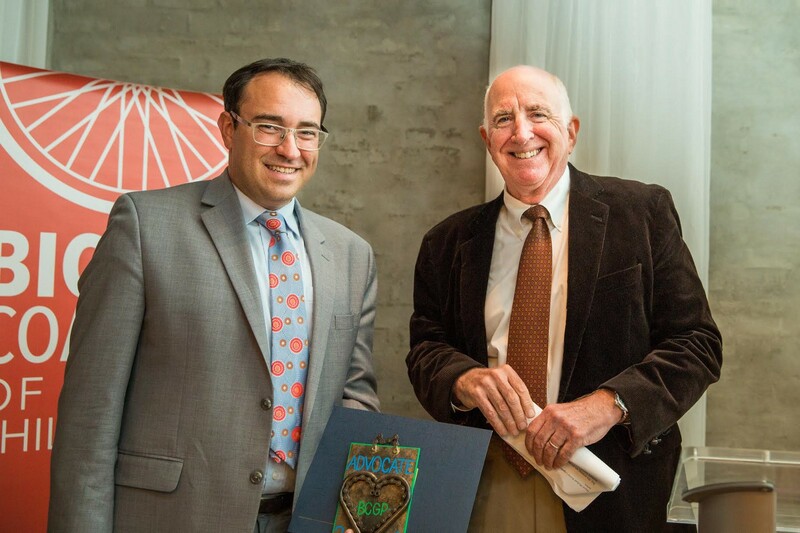 The event was held at Front & Palmer in Fishtown, and honored Patrick Cunnane with the Maguire Award, and gave awards to Andrew Stober of University City District, Leslie S. Richards of PennDOT, and Katie Migliocco of Capital One. Bicycle Coalition of Greater Philadelphia members, friends, and supporters were additionally introduced to new Cadence Youth Cycling program manager Taylor Kuyk-White, and heard about the program’s success from cyclist Krystal Philson. Bicycle Coalition of Greater Philadelphia Executive Director Sarah Clark Stuart recently won a grant to travel to Copenhagen, Denmark, with representatives of Philadelphia Government to learn about some of the simple, safe infrastructure of Scandinavia, and how to bring it back to Philadelphia. Copenhagen has regularly been called the best biking city in the world, and had a mode share of 45 percent, as of 2014. This sort of thing doesn’t just happen. The city leaders in Copenhagen have worked to make sure cycling is a safe, viable form of transit for anyone — something Philadelphia is still severely lacking. When she came back, she began working on plans Philadelphia can take from that city, including the Bicycle Coalition’s upcoming “Hub and Spoke” campaign, which supporters will begin hearing about in early 2017. Philly bicyclists know how difficult it is to maneuver around delivery trucks and parked cars in bike lanes. 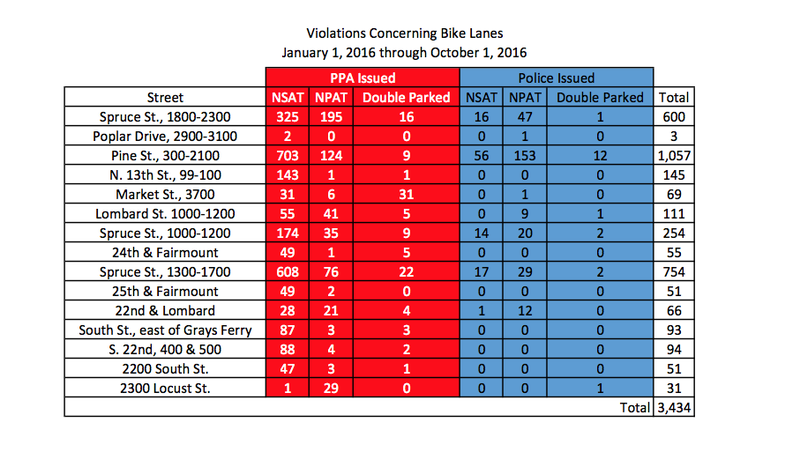 And since we began meeting with the Philadelphia Parking Authority in 2014, ticketing has gone up for those people who decide their convenience is more important than cyclists’ safety. According to PPA statistics for October 2016, ticketing is up 120 percent between 2014 and 2015, and another 6 percent between 2015 and 2016, so far. That’s good, but not good enough, and the Bicycle Coalition will continue pushing for real solutions to stop parking in bike lanes. The Southeastern Pennsylvania Transportation Authority went on strike for nearly a week in late October and early November. During that time, the Bicycle Coalition of Greater Philadelphia came out to help new cyclists get around the city, and park. We greeted cyclists each morning at the Municipal Services Building with bike maps, energy bars, and stickers; we held bike trains into Center City; and we created a new map for cyclists, depicting usable bike lanes, bike share stations, bike shops, and our bike ride meeting spots. Lots more biked during the strike — and with more people riding bikes and driving cars, it drove home that cyclists need better, safer infrastructure. Our volunteer counted 609 total bikes per hour during rush hour at 13th and Spruce — an increase of 53 percent over 2014 morning counts. 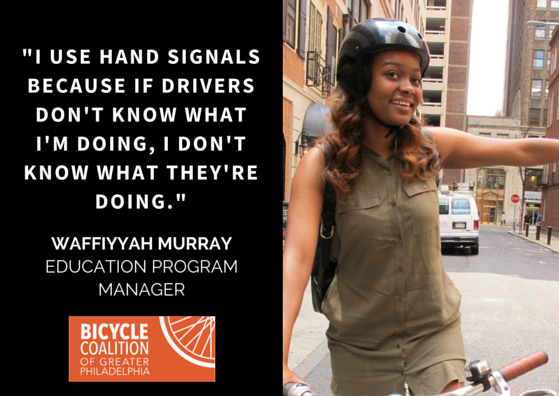 On the South Street Bridge, Bicycle Coalition staff members Waffiyyah Murray counted 521 bicycles per hour during Friday’s rush hour — an increase of 29 percent over Fall 2015 morning counts. The Chestnut Street bridge saw 140 bikes per hour during rush hour, an increase of 37 percent when compared to 2015 morning numbers. Walnut Street: 194 bikes per hour, an increase of 34 percent. 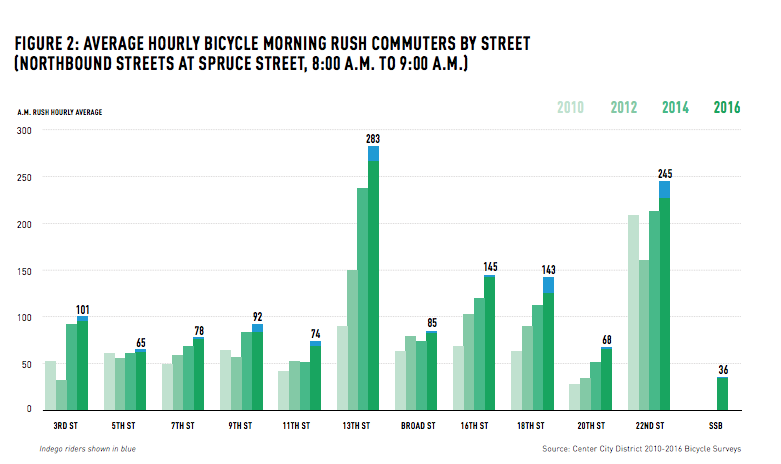 And Market Street averaged 133 bikes per hour during rush hour, a whopping 75 percent increase when compared to 2015’s morning counts. We spoke about what we learned from the Strike in a December podcast. …Oh yeah, the Bicycle Coalition also started its own podcast in in 2016. Get all the episodes by clicking on these words, and go ahead and subscribe on iTunes. 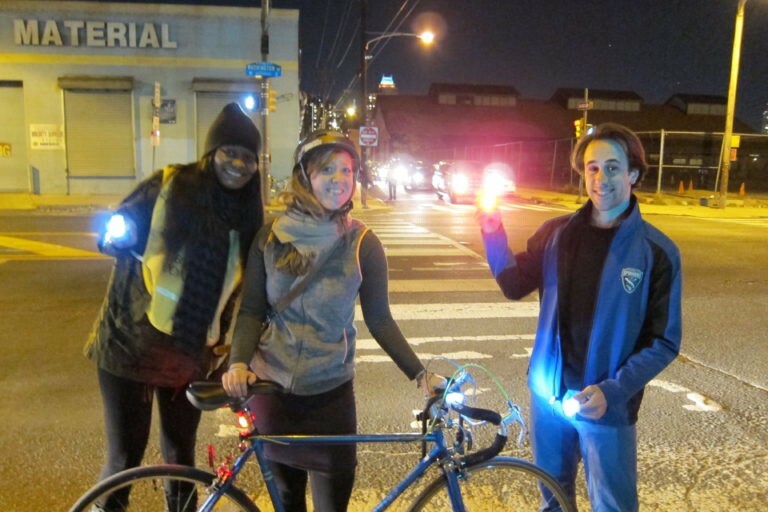 Thanks to the donations of Councilpeople Kenyatta Johnson and Mark Squilla, who respectively represent the west and east ends of South Philadelphia, SEPTA, and Sowinski Sullivan Architects, the Bicycle Coalition was able to hand out 400 free pairs of bike lights to cyclists on the 1500 and 1100 blocks of Washington Avenue. 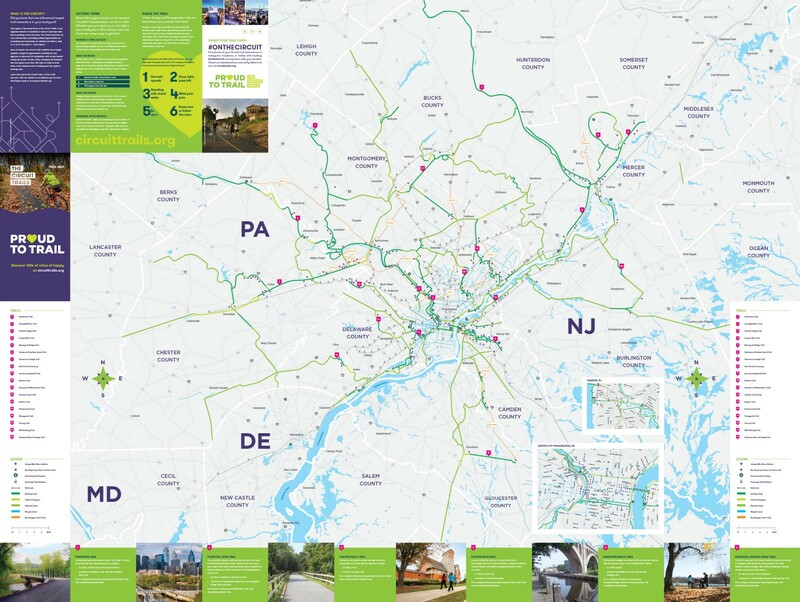 Over the course of 2016, The Circuit added 12.5 miles to its network, bringing the total to 320 miles complete throughout the 9-county Greater Philadelphia Region. The Kenney Administration took an unprecedented step on November 7 and unveiled Philadelphia’s first-ever Vision Zero Executive Order, a legal document that will pave the way for Philadelphia’s new Office of Complete Streets and a Vision Zero Task Force — for which the Bicycle Coalition and Philadelphia Vision Zero Alliance had been advocating all year. Mayor Kenney tasked his new Vision Zero Task Force to develop an Action Plan in 120 days to eliminate traffic deaths by 2030. Vision Zero is needed because, as we found in our Summer of Maps project with Azavea, crashes in the city are concentrated in distinct sections and neighborhoods of Philadelphia that are not getting enough attention. Similar conclusions were — and are— reached from the Bicycle Coalition’s new PHL Traffic Victims website, which lists and depicts every single fatal victim of traffic violence in Philadelphia. The administration also hired a Director of Complete Streets, which the Bicycle Coalition had been pushing for since before the 2015 election. 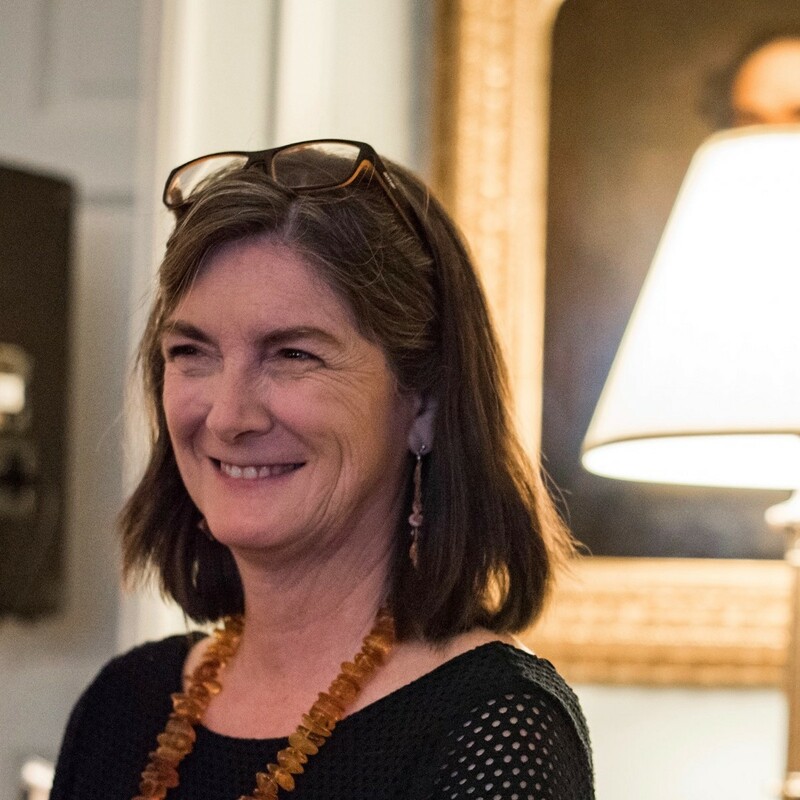 The new director, Kelley Yemen, was hired in mid-October and profiled soon after in the Philadelphia Inquirer. The Bicycle Coalition of Greater Philadelphia’s Executive Director Sarah Clark was chosen as a member of the city’s Vision Zero Task Force, which will provide the city with a long-term and short-term action plan, and which will submit findings to the Mayor, City Council Managing Director, Deputy Managing Director for Transportation and Infrastructure, and the Chief Clerk of Council. 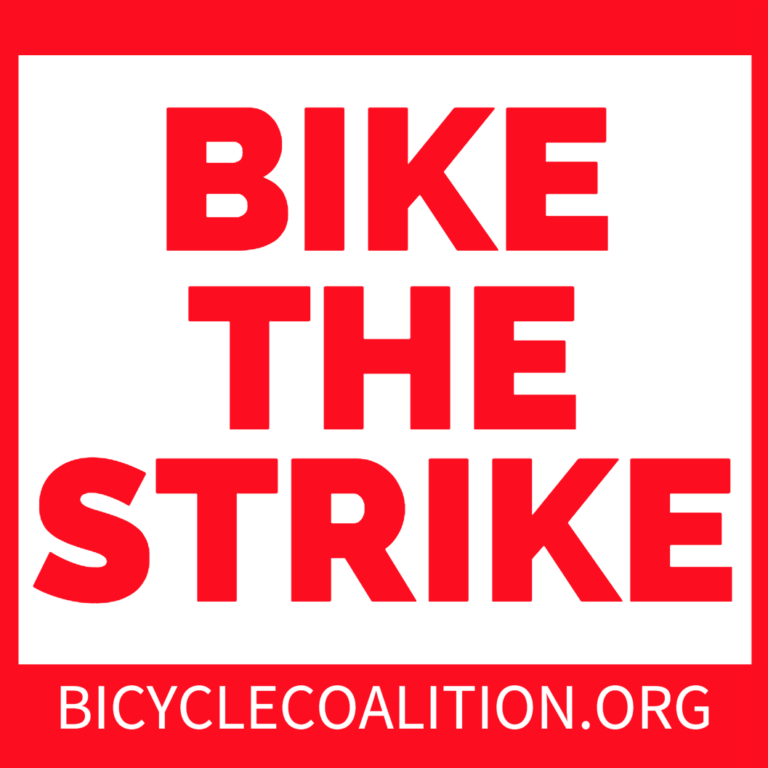 Communications at the Bicycle Coalition of Greater Philadelphia, freelance journalist.